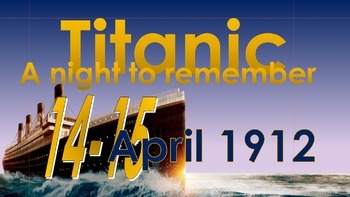 PowerPoint presentation; activities and task sheets on the Titanic disaster of April 14-15 1912. •	Who was to blame? •	Titanic: Truth or myth? 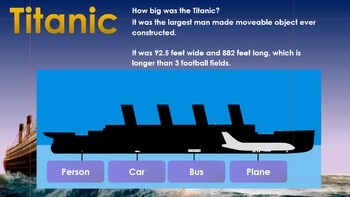 •	Identify the main reasons why the Titanic sank. 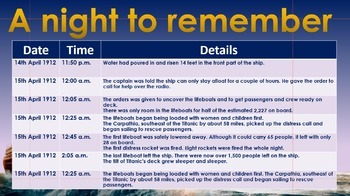 •	Analyse the main reasons why the Titanic sank. •	Evaluate which reason was the most important in causing the Titanic to sink. •	Analyse the most important cause of people losing their lives on the Titanic. •	Evaluate the main reason so many people died on the Titanic. Task 1: In a group, discuss and decide who was responsible for Titanic sinking. 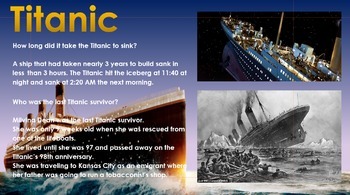 Task 1/2: Take part in a quiz about Titanic. Task 4: Write a news story reporting the sinking of Titanic.